Danny Fisher is a career athlete with many years of experience in the fitness industry, training at a competitive level. Danny is a happily married man with kids. He is 30 and has traveled the world and worked with many professionals, pushing and tailoring results. many life experiences. He understands personal training and understands that sometimes health and fitness can have ups and downs with family and the work commitments of London life. That is why Danny programmes realistic, motivational content into all his Greenwich personal training, fitness classes and course programs. "I am here to motivate and remind you of the amazing values of having a healthy mind, body and spirit. I make fitness important again! There is always room for improvement and I can help you make that happen. My fitness programmes really do change my clients lives for the better! Together We Get Your Results! Fun, motivational fitness classes to suit all abilities and training styles. Tailored individual programs that get results. Every fitness class is tailored for your individual or group needs. 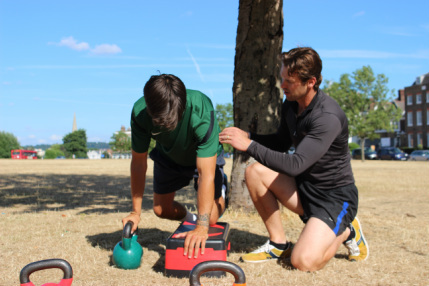 Book your Personal Trainer in Greenwich and Blackheath Park area Now. Gym Not Getting the Results Your Want? Personal Training can work for YOU!